Last post of 2017 and it's a revival of a collection of Chuck Willis OKeh sides which was originally posted in October 2008. As is usual with these "revival" posts I've added new cover and label scans, plus I've also boosted the volume slightly. Included in the download is a selection of original 45 label scans sent in by Joan K.
I was never a big fan of Chuck Willis and as I stated back in the original post this LP remained unplayed and lost on my shelves for many years, and I must confess that since that post I've scarcely listened to the tracks again. However, I've been listening to it repeatedly over the last week or so in the build up to this post, and once more I've realized that this really is a cracking collection of prime R&B. The sleevenotes by Clive Anderson are excellent, giving insight into the background behind these tracks recorded for OKeh between 1951 and 1956. They are also highly evocative of the music milieu of Atlanta, Chuck's home town, and the place where he started out on his music career. It was thanks to local DJ Zenas "Daddy" Sears that he was spotted and steered towards Columbia records man Danny Kessler. 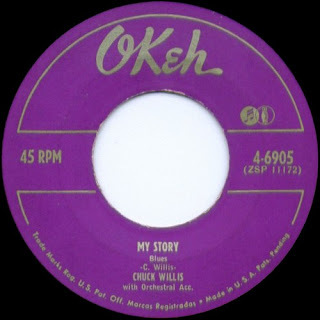 Chuck Willis was not only a talented singer, he was also a gifted songwriter and most of his records both for OKeh and later Atlantic were self penned. His first session for Columbia took place in January 1951 with his first release (" It Ain't Right To Treat Me Wrong" / "Can't You See") coming out in May 1951 on Columbia 30238. 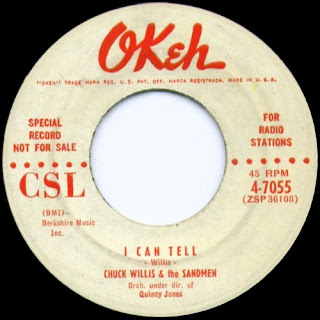 In the meantime Columbia had decided to revive the old OKeh label as its outlet for R&B recordings under the management of Kessler and Chuck's releases were thereafter issued on the subsidiary label. 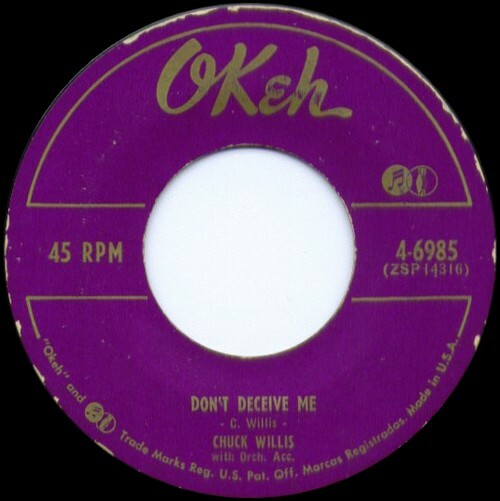 OKeh started issuing records in July 1951 but the first scheduled record by Chuck ("Let's Jump Tonight" / "Be Good Or Be Gone") which was due to be the sixth issue on the label, seems to have been cancelled and his first OKeh disc was "I Tried" / "I Rule My Home" which was issued in August 1951. His five year spell at OKeh was reasonably successful with five R&B chart entries being achieved: "My Story," "Going To The River" (a cover of a Fats Domino hit), "Don't Deceive Me," "You're Still My Baby" and "I Feel So Bad." 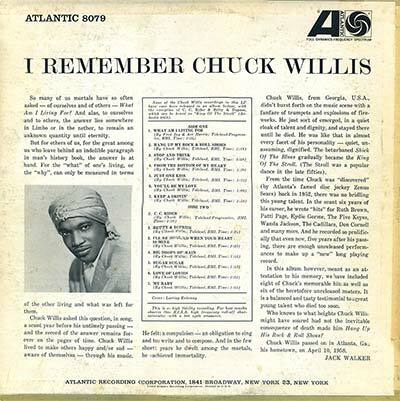 When Chuck Willis signed up with Atlantic in early 1956, his career moved up a gear, for his records not only featured on the R&B charts, they also started to appear in the pop charts. His version of the old blues "C. C. Rider" reached number 12 in the Billboard pop chart in May 1957 and "Betty And Dupree" reached number thirty three in April 1958. Both of these songs were suited to a new dance craze called The Stroll and Chuck became known as The King Of The Stroll. 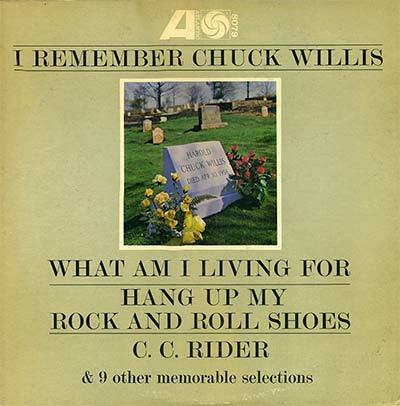 His biggest pop hit came in May of 1958 - "What Am I Living For" and "Hang Up My Rock And Roll Shoes," a pairing which proved to be ominously titled for by the time they were entering the charts Chuck was deceased, having died in hospital on April 10th during an operation on stomach ulcers. "Be Good Or Be Gone" and "Let's Jump Tonight" were recorded on January 26th 1951. Both sides were scheduled to be released on OKeh 6805, i.e. the sixth release on the label. Apparently this record remained unreleased. 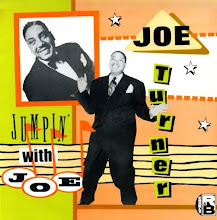 "Let's Jump Tonight" b/w "It's Too Late Baby" was released as OKeh 6841 in December 1951. "I Tried," "It's Too Late Baby" and "Baby's On My Mind" were recorded on 27th June 1951. "I Tried" b/w "I Rule My House" was released on OKeh 6810 in August 1951. "It's Too Late Baby" was B side of "Let's Jump Tonight" OKeh 6841, December 1951. "Baby's On My Mind" was not released on single. "Loud Mouth Lucy" was recorded on February 27th 1952. 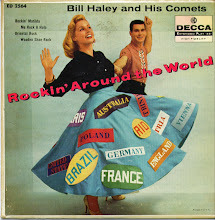 Released on OKeh 6873 (b/w "Here I Come") in May 1952. "Wrong Lake To Catch a Fish" was recorded on 26th June 1952. Released on OKeh 6930 as B-side of "Salty Tears" in December 1952. "You Don't Love Me (You Broke My Heart)" was recorded on 19th November 1952. Unreleased. "Keep A Knockin'" and "Need One More Chance" were recorded on February 5th 1954. 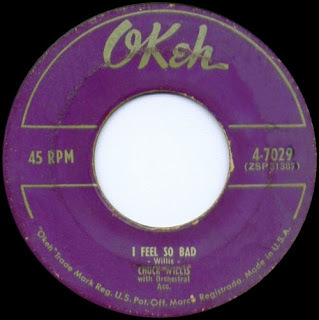 "Need One More Chance" was released on OKeh 7029 (B-Side of "I Feel So Bad") in May 1954. "Keep a Knockin'" was not released. "Change My Mind" and "I Don't Mind If I Do" were recorded on June 24th 1954. 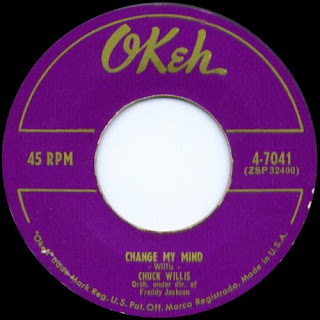 "Change My Mind" b/w "My Heart's Been Broke Again" was released on OKeh 7041 in August 1954. "I Don't Mind If I Do" was not released. 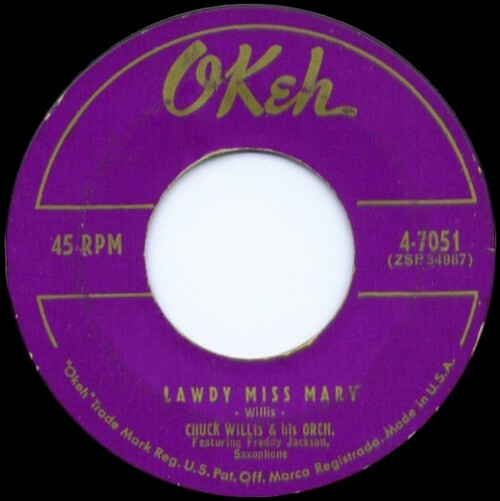 "Lawdy Miss Mary" was recorded on December 17th 1954. 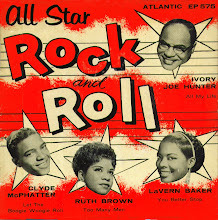 Released on OKeh 7051 (b/w "Love-Struck") in February 1955. "Search My Heart" and "I Can Tell" were recorded on April 15th 1955. "I Can Tell" was released on OKeh 7055 (b/w "One More Break") in May 1955. "Search My Heart" was released on OKeh 7062 (b/w "Ring-Ding-Doo") in October 1955. "Break My Rule" was recorded on January 26th 1956 but not released as a single. 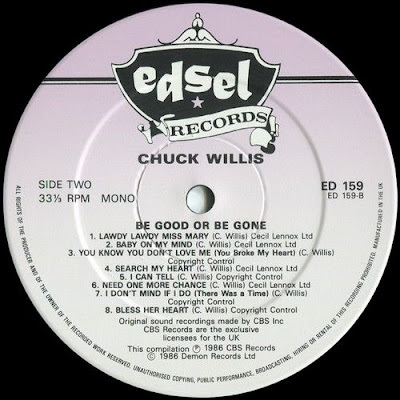 Following the original posting of "Be Good Or Be Gone" in October 2008, an anonymous donor contributed an Atlantic LP "I Remember Chuck Willis" (Atlantic 8079). There are a number of Chuck Willis compilations available and they are easy to find on well known sellers' websites. 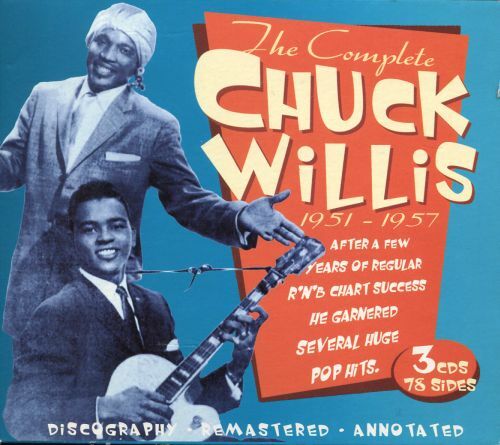 A few years ago I bought the JSP 3CD set "The Complete Chuck Willis 1951 - 1957." I hardly listened to it until I started preparing this blog post and I must say that I found it tons o' fun. 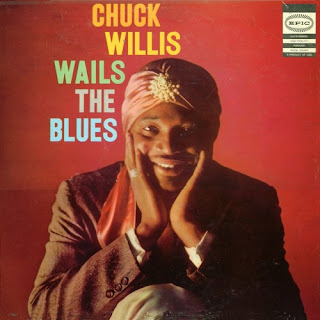 There is no doubt that Chuck Willis was a major talent. He was probably at his best performing what I like to call "Big Beat Ballads" - which mixed pop and blues influences. Some of his OKeh sides have tremendous blues feeling, especially where guitarist Roy Gaines is given prominence. You can buy this set with confidence. By the way, the title is slightly misleading as the set includes his 1958 Atlantic sides. I think every OKeh and every Atlantic side is included. 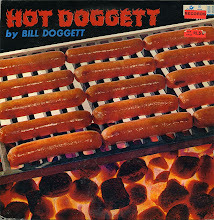 Thanks to Joan K for label scans and the Epic cover above. Happy New Year Everyone! 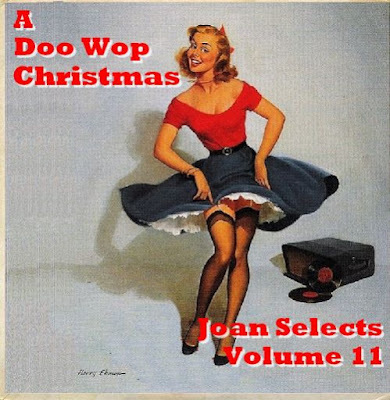 ... yep, that time of year when we revive Joan Selects Volume 11 - A Doo Wop Christmas! First posted (with a different cover) in December 2008. A lot of water has flowed under the bridge since then but somehow Be Bop Wino bops on. With thanks to Joan for the doowop delights and also thanks to all who contribute and comment on the blog. Merry Christmas to everyone out there in Be Bop Wino Land. 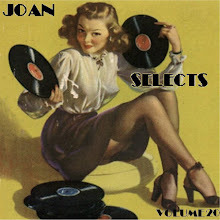 We bring our short series of Johnny Otis related posts to a conclusion with this homemade comp of sides recorded by The Robins for Savoy in late 1949 / early 1950. We've already met The Robins in the previous post Johnny Otis Presents which included sides they recorded for the Bihari Brothers group of labels - Modern, RPM and Crown. That post includes a brief summary of The Robin's recording career for the Biharis plus the lead up to their split which saw the formation of The Coasters as well as the continued existence of The Robins. The Robins had their origins in a vocal trio called the A-Sharp Trio which consisted of tenor Ty Terrell (real name Terrell Leonard), and the brothers Billy and Roy Richard (tenor and baritone). They made their way from their home turf near Oakland to the Watts area of Los Angeles where they took part in the Thursday night amateur hour competition at the Johnny Otis / Bardu Ali owned Barrelhouse Club. A good performance earned them a regular spot at the club and the trio became a foursome when Otis had the idea of teaming them up with another Barrelhouse regular, baritone / bass singer Ulysses "Bobby" Nunn. 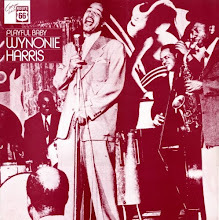 The group made their recording debut on an April 1949 release on Excelsior, the Johnny Otis Orchestra disc "My Baby Done Told Me," billed as "The Four Bluebirds." The group preferred the name "Robins" as this was more in line with the bird names of the two currently most successful vocal groups, The Ravens and The Orioles. In May 1949 The Robins cut four sides for Aladdin which were quickly issued on two singles which sold poorly. In the autumn of 1949 the Johnny Otis band was signed to Savoy Records with their first recording session for the label being held on November 10th. 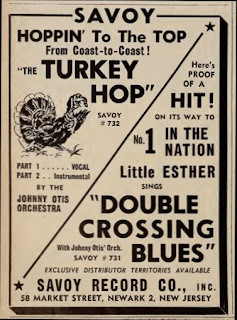 For the second Savoy session on December 1st, the Otis band was accompanied by The Robins. 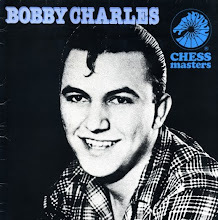 The biggest success of the session however wasn't one of the four Robins tracks recorded, it was "Double Crossin' Blues" which was a duet between Little Esther and Bobby Nunn. "If It's So Baby" was the best selling of the Robins tracks, but was a minor hit compared to the massive success of the duet. 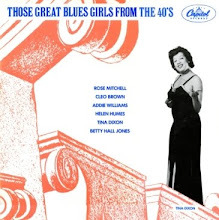 The Robins were involved in the Otis session of January 11th 1950, cutting sides with Mel Walker and Little Esther (as The Bluenotes), as well as providing vocals on one side of the two-parter "Turkey Hop." A Robins track remained unreleased on single, "I Found Out My Troubles," being eventually released on LP in 1978. 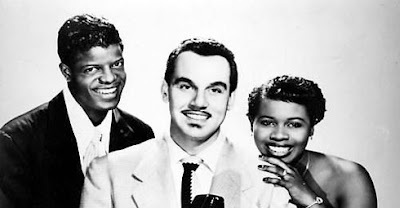 The final Robins / Johnny Otis band session for Savoy took place on February 13th 1950 at which four more tracks were cut. Session and original release details can be read below. 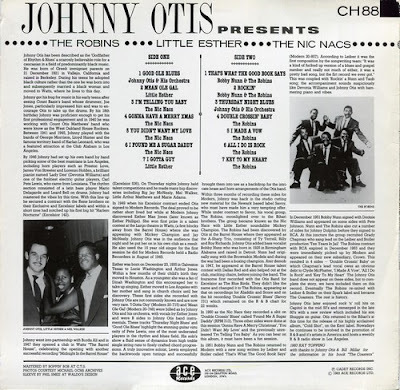 The Robins had a fall out with Johnny Otis over their fee for the recording session and thus never did get to tour with the successful Johnny Otis Rhythm and Blues Caravan show which featured the band, Little Esther and Mel Walker. By June 1950 The Robins had quit Savoy and signed with John Dolphin's Recorded In Hollywood label. The story continues - on Marv Goldberg's website! 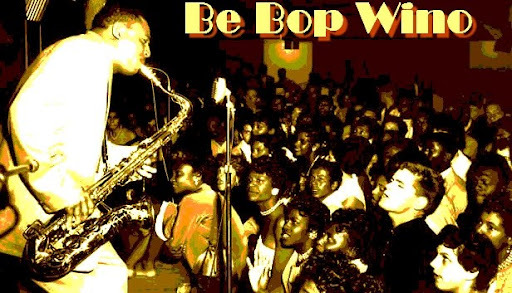 For a shortened version see the Be Bop Wino post Johnny Otis Presents. Savoy 726 - If I Didn't Love You So / If It's So Baby - The Robins - January 1950. B-Side, "If It's So Baby" # 14 in Billboard best selling R&B records chart, 4th February 1950. Savoy 732 - The Turkey Hop Part 1 / The Turkey Hop Part 2 - February 1950. One side was an instrumental by the Johnny Otis Orchestra, the other side had a vocal by The Robins. Savoy 738 - There Ain't No Use Beggin' / Our Romance Is Gone - The Robins With The Johnny Otis Quintette - April 1950. Savoy 752 - I'm Living O.K. 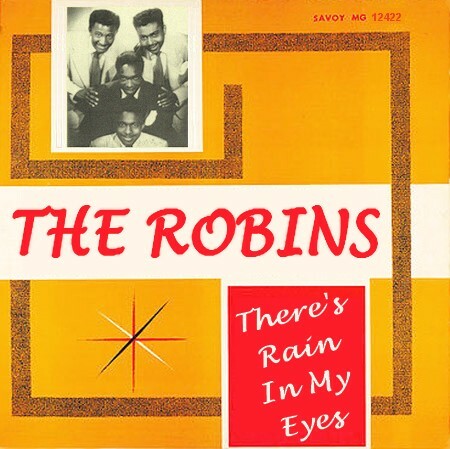 / There's Rain In My Eyes - The Robins with The Johnny Otis Quintette - June 1950. Savoy 762 - I'm Through / You're Fine But Not My Kind - The Robins - September 1950. Unreleased on single - I Found Out My Troubles. First released on Savoy 2LP set "The Original Johnny Otis Show" (SJL 2230) in 1978. "If It's So Baby," "If I Didn't Love You So," "Our Romance Is Gone" and "There's Rain In My Eyes" were recorded on December 1st, 1949 in Los Angeles. Personnel: Johnny Otis (vibes); Devonia Williams (piano); Pete Lewis (guitar); Mario Delagarde (bass); Leard Bell (drums); The Robins (vocal group). "The Turkey Hop Part 2" was recorded on January 11th, 1950 in Lose Angeles. 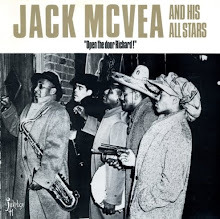 Personnel: John Anderson (trumpet); Floyd Turnham (alto sax); Big Jay McNeely (tenor sax); Bob McNeely (baritone sax); Devonia Williams (piano); Pete Lewis (guitar); Mario Delagarde (bass); Johnny Otis or Leard Bell (drums); The Robins (vocal group). "I Found Out My Troubles" was also recorded on January 11th, 1950 in Los Angeles. 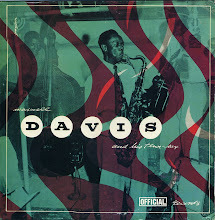 Personnel: possibly Big Jay McNeely (tenor sax); Devonia Williams (piano); Pete Lewis (guitar); Mario Delagarde (bass); Leard Bell (drums); The Robins (vocal group). "I'm Through," "I'm Living O.K.," "There Ain't No Use Beggin'," and "You're Fine But Not My Kind" were recorded on February 13th, 1950 in Los Angeles. Personnel: Johnny Otis (vibes); Devonia Williams (piano); Pete Lewis (guitar); Mario Delagarde (bass); Leard Bell (drums); The Robins (vocal group). While Little Esther was very much the star of the successful Johnny Otis Orchestra's run of hits in 1950, her co-singer on many of the discs, Mel Walker, also enjoyed success as a solo singer on several Savoy releases. 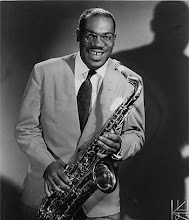 Mel Walker (real name Melvin Lightsey) was born in Bloomburg, Texas in November 1929 and raised in East Los Angeles. His ability to sing in a style not dissimilar to that of Charles Brown was spotted at the Barrelhouse Club and he became a regular performer in the shows there. 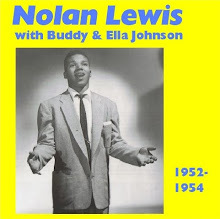 His recording debut with the Otis band, accompanied by The Bluenotes (The Robins) came in January 1950 on "Cry Baby." His first real solo recording success was with "Rockin' Blues" which reached number 2 in the Billboard R&B chart in March 1951. 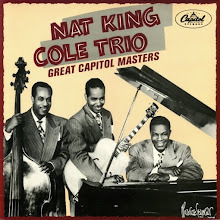 This was the first of a triple whammy of big hits with "Gee Baby" (Savoy 777, not on this collection) also reaching number 2 at the beginning of June 1951, and "Sunset To Dawn" hitting number 10 in January 1952. However, "Sunset To Dawn" was the final chart entry in the astonishing run of success which the Otis band and vocalists had enjoyed in 1950-51 on Savoy. In December 1951 the Johnny Otis band, including Mel, started recording for Mercury but their spell with the major label resulted in only one further chart success, a cover version of Floyd Dixon's "Call Operator 210" featuring a vocal by Mel which reached number 4 on the Billboard R&B chart in August 1952. Johnny Otis left Mercury in mid 1952, but in October 1953 Mel recorded for the label under his own name. He had three singles from these sessions out in the first half of 1954. The session details show that the backing band included Don Johnson, George Washington, Preston Love, Lorenzo Holden, James Von Streeter, Devonia Williams, Pete Lewis and Leard Bell. In other words, a Johnny Otis line up. 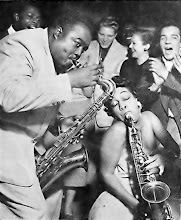 Ben Webster and Curtis Lowe, who had featured on some Otis recordings for Mercury back in '51, were also included in a reinforced tenor sax section while the band was directed by Melba Liston. Mel's Mercury singles failed to make much of an impression. 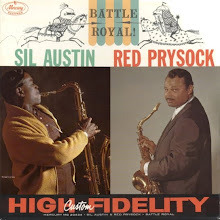 He was still touring with Otis and Floyd Dixon in the first half of 1954 and at some indeterminate time during that year he was on a session for Peacock with the Otis band. "I Won't Be Your Fool No More" (Peacock 1636) which came out in October 1954 was a good blues performance which had harmonica by Pete Lewis. At some time in the second half of 1954 the wheels came off Mel's music career in spectacular fashion when he was arrested and jailed on drugs charges in Baltimore while on tour with Johnny Otis. In fact Mel was already a heroin addict before he joined the Otis band. 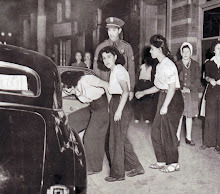 Sadly several members of the Otis organisation, Mel, Little Esther, and Von Streeter, had drug addiction problems. Otis lost touch with Mel while he was serving his sentence and the singer slipped off the music radar. In 1964 Mel Walker's body was found in a Los Angeles alleyway, apparent cause of death being a drugs overdose. The 30th April 1964 copy of the California Eagle had a brief but very grim report on its front page. Cry Baby / I'm Not Falling In Love With You (Regent 1016). "Cry Baby" by Johnny Otis Orchestra, vocal by Mel Walker and the Bluenotes. "I'm Not Falling In Love With You" by Johnny Otis Quintette, vocal by Devonia. Released in February 1950. Dreamin' Blues / Helpless (Regent 1018) - Mel Walker with Johnny Otis Orchestra. Released in May 1950. Strange Woman / Lonely Blues (Regent 1022) - Johnny Otis Orchestra with Mel Walker. Released in September 1950. Rockin' Blues / My Heart Tells Me (Savoy 766) - Johnny Otis Orch. with Mel Walker. Released in November 1950. #2 in Billboard best selling R&B records chart, 24th March 1951. 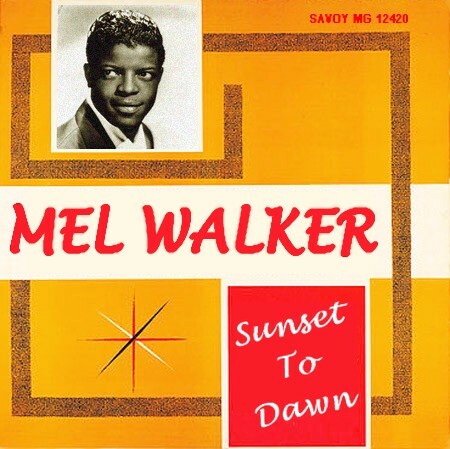 Sunset To Dawn / Feel Like Cryin' Again (Savoy 821) - Mel Walker with Johnny Otis Orch. Released in November 1951. #10 in Billboard best selling R&B records chart, 19th January, 1952. 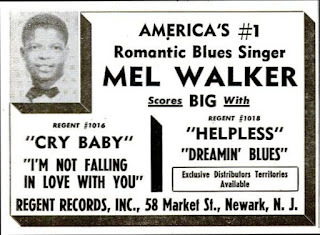 Help Me Blues / Heartache Here I Come (Savoy 849) - Mel Walker. Released in June 1952. "Three Magic Words" was first issued on the Savoy 2LP set "The Original Johnny Otis Show" (SJL 2230) in 1978. 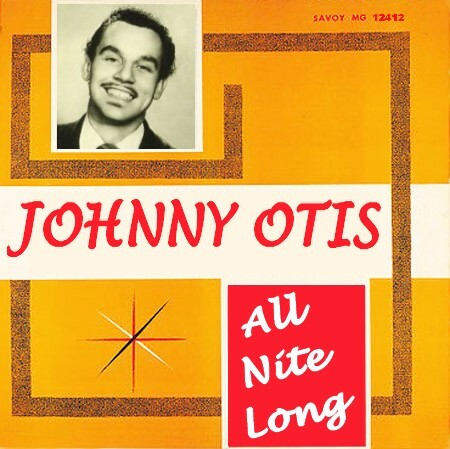 "Fool's Gold," "Turn The Lights Down Low," "It Can Never Happen Again," "Just Another Flame," "Walk My Blues Away" aka ""Hand Me Down Blues" were first issued on the Savoy 2LP set "The Original Johnny Otis Show Volume II" (SJL 2252) in 1980. John Anderson (trumpet); Floyd Turnham (alto sax); Big Jay McNeely (tenor sax); Bobby McNeely (baritone sax); Devonia Williams (piano); Pete Lewis (guitar); Mario Delagarde (bass); Johnny Otis (drums); Mel Walker, The Bluenotes aka The Robins (vocals). 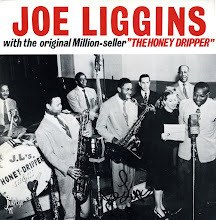 Possibly Lorenzo Holden or James Von Streeter (tenor sax); Johnny Otis (vibes); Devonia Williams (piano); Pete Lewis (guitar); Mario Delagarde (bass); Leard Bell (drums); Mel Walker (vocal). Don Johnson, Lee Graves (trumpets); George Washington (trombone); Lorenzo Holden, James Von Streeter (tenor saxes); Walter Henry (alto and baritone saxes); Johnny Otis (vibes); Devonia Williams (piano); Pete Lewis (guitar); Mario Delagarde (bass); Leard Bell (drums); Mel Walker (vocals). as February 27th session with Hosea Sapp (trumpet) added. as August 12th session but Hosea Sapp (trumpet) out. Don Johnson (trumpet); George Washington (trombone); Walter Henry (alto sax); Lorenzo Holden, James Von Streeter (tenor saxes); Johnny Otis (vibes); Devonia Williams (piano); Pete Lewis (guitar); Mario Delagarde (bass); Leard Bell (drums); Mel Walker (vocals). As January 5th and January 10th sessions with addition of Earle Warren (alto sax). 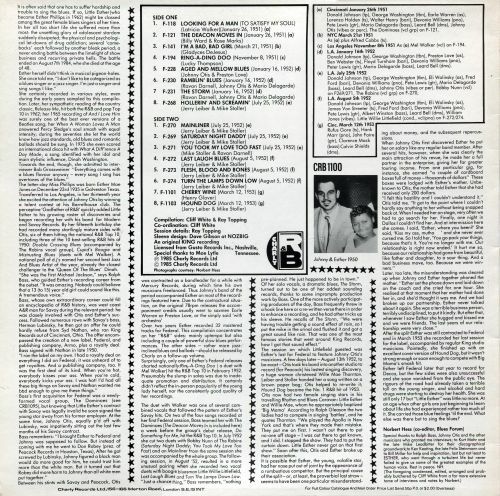 Bruyninckx Discography, Billboard, The Cash Box, Pete Welding's sleevenotes and interview with Johnny Otis for the Savoy 2LP set "The Original Johnny Otis Show Volume II," www.discogs.com , www.45worlds.com , and YouTube. The sad end of Mel Walker is referred to in his Wikipedia article and is sourced from "Blues - A Regional Experience" by Bob Eagle and Eric S. LeBlanc. His arrest in Baltimore and later demise is also referenced in Pete Welding's sleevenotes for "The Original Johnny Otis Show Volume II." 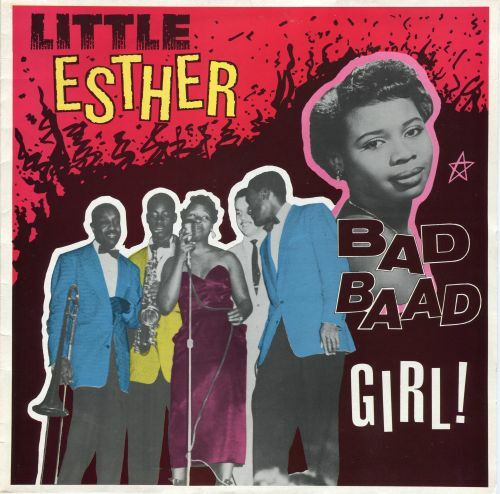 Little Esther - Bad Baad Girl! Our previous post on Little Esther's big selling Savoy sides ended with the teenage chanteuse leaving that label for the newly founded Federal label, a Ralph Bass run subsidiary of King Records. Her first recording session for Federal took place in January 1951. In the meantime the Johnny Otis band continued to record for Savoy until March 19th 1951 but his anticipated transfer to Federal didn't happen. 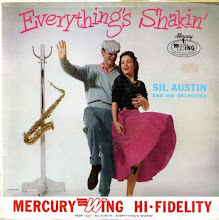 Instead he signed for Mercury and the band recorded for that label from December 1951 to July 1952. 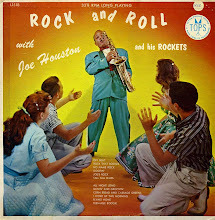 Thereafter Johnny went to Don Robey's Houston based Peacock Records for whom he worked in both Houston and Los Angeles as A&R man, producer and band leader on tracks recorded by artists like Big Mama Thornton, Johnny Ace and Little Richard. However one look at the personnel on these Federal recordings by Little Esther (which you can find on the back cover of this LP) shows that the backing band on her 1951 and 1952 tracks is indeed the Johnny Otis Orchestra doing a spot of moonlighting. 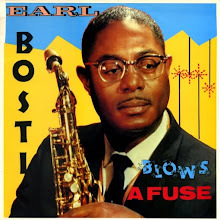 As you can see in the original release information below, backing on Little Esther discs was at first credited to the "Earle Warren Orchestra," ex-Basie man Earle being the alto sax player in Johnny's band at that time. Then there was the not-at-all obvious pseudonym of the "J. and O. Orchestra," and by the time of the 1952 releases there was no mention of the accompanying band. 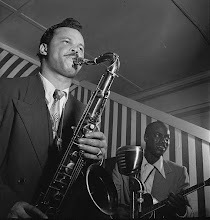 When Preston Love (Johnny's band mate back in the Omaha days and then in the early days of Johnny's big band) replaced Earle Warren on alto sax in 1952, some discs credited to the Preston Love Orchestra were released on Federal, again disguising the fact that they were by the Johnny Otis Orchestra. 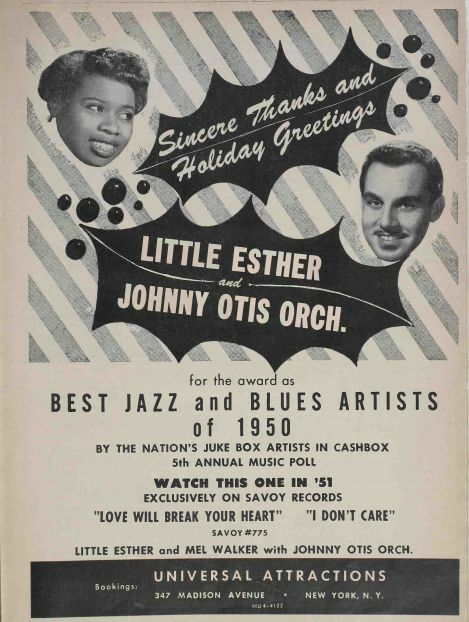 During 1951 and at least the first half of 1952 Little Esther continued to tour with the Johnny Otis group. 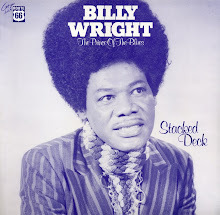 Other Otis-connected artists appearing on these sides are Mel Walker and Bobby Nunn, so this collection fits in nicely with our series of Johnny Otis related posts. The very informative sleeve notes by Norbert Hess tell the tale of Little Esther's estrangement from Johnny Otis involving Esther's mother and a heap of cash. 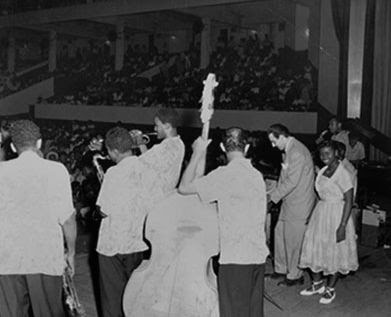 The Otis band backed Esther for the last time in August 1952. 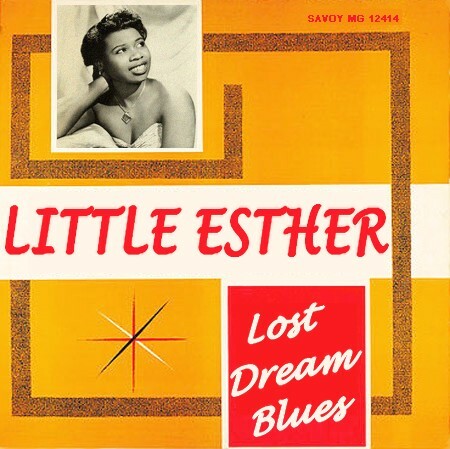 In a final session for Federal in March 1953, Little Esther was backed by King studio musicians including Rufus Gore and Hank Marr. In July and September 1953 Little Esther recorded for Decca. These sides went nowhere and the recent spell of stardom already seemed to have faded fast away as what may euphemistically be called "health problems" began to take their toll. For the rest of her sadly all too short life Little Esther or Esther Phillips as she was now known would be plagued by addiction problems although there were periods when she recorded strong material and made dents in both the pop and R&B charts. In 1975 her version of the Dinah Washington hit "What A Difference A Day Makes" was an international success, reaching number 20 in the US pop chart and number 6 in the UK chart. For the cognoscenti her 1971 recording of Gil Scott Heron's "Home Is Where The Hatred Is" is a harrowing classic. Esther Phillips died aged 48 in August of 1984. But here on Be Bop Wino we rarely move beyond the 1950's so enjoy Little Esther, Johnny Otis and the band, Bobby Nunn, Mel Walker, The Dominoes and Little Willie Littlefield on these blasters from back in the day. 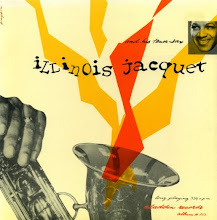 Federal 12016 - "The Deacon Moves In" by Little Esther with the Earle Warren Orchestra, b/w "Other Lips, Other Arms" - Little Esther with the Earle Warren Orchestra. February 1951. Federal 12023 - "I'm A Bad, Bad Girl" by Little Esther with the Earle Warren Orchestra, B-Side of "Don't Make A Fool Out Of Me" - Little Esther with the Earle Warren Orchestra. April 1951. 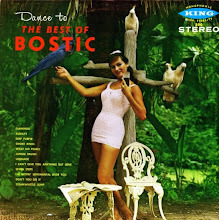 Federal 12036 - "Looking For A Man (To Satisfy My Soul)" by Little Esther with the Earle Warren Orchestra, b/w "Heart To Heart" - Little Esther and The Dominoes with the Earle Warren Orchestra. July 1951. Federal 12055 - "Ring-A-Ding-Doo" by Little Esther and Mel with the J. and O. Orchestra, b/w "The Crying Blues" by Little Esther with the J. and O. Orchestra. November 1951. 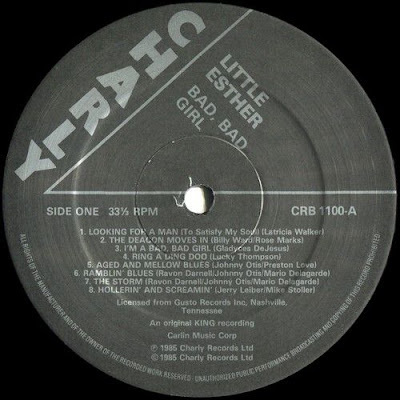 Federal 12063 - "The Storm" by Little Esther, B-Side of "Summertime" - Little Esther. March 1952. Federal 12078 - "Aged And Mellow" by Little Esther, B-Side of "Bring My Lovin' Back To Me" - Little Esther. May 1952. Federal 12090 - "Ramblin' Blues" by Little Esther, b/w "Somebody New" by Little Esther. August 1952. Federal 12100 - "Saturday Night Daddy" by Little Esther & Bobby Nunn, b/w "Mainliner" by Little Esther. October 1952. Federal 12108 - "Last Laugh Blues" by Little Esther and Little Willie, b/w "Flesh, Blood And Bones by Little Esther. November 1952. Federal 12115 - "Turn The Lamps Down Low" by Little Esther and Little Willie, b/w "Hollerin' And Screamin'" by Little Esther. February 1953. Federal 12122 - "You Took My Love Too Fast" by Little Esther and Bobby Nunn, b/w "Street Lights" by Little Esther. April 1953. 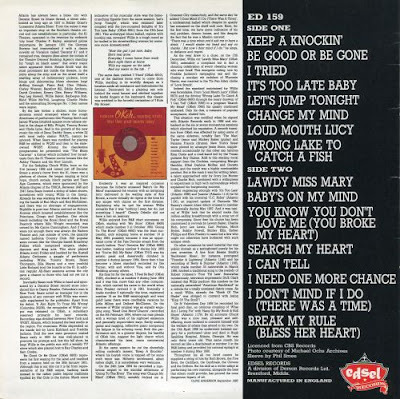 Federal 12126 - "Hound Dog" by Little Esther, b/w "Sweet Lips" by Little Esther. April 1953. Federal 12142 - "Cherry Wine" by Little Esther, b/w "Love Oh Love" by Little Esther. September 1953. 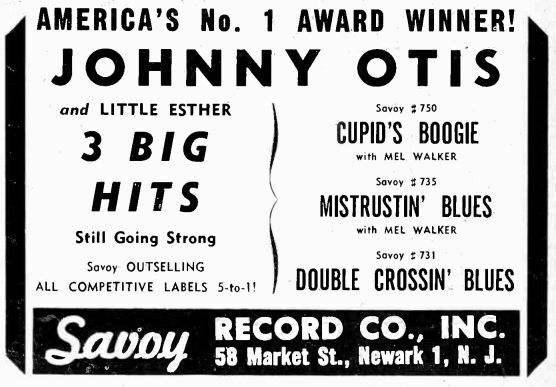 1950 was the year when Johnny Otis was the top selling R&B artist, or perhaps more accurately Johnny Otis with Little Esther, Mel Walker and The Robins. "Double Crossing Blues," "Mistrustin' Blues" / "Misery," "Cupid's Boogie," "Deceivin' Blues," "Wedding Boogie" / "Far Away Blues," "Cry Baby," "Dreamin' Blues" and "If It's So Baby" / "If I Didn't Love You So" were all R&B chart hits for Otis and his associated vocal acts. The artist who dominated this series of hits was Little Esther, a 13 year old Dinah Washington influenced prodigy whom Otis discovered when he happened to drop in on a talent show at the Largo Theater in Watts, LA, situated a few blocks from his own Barrelhouse Club. Esther Mae Jones didn't win but she impressed Otis enough for him to offer her a spot at the Barrelhouse. Still going under her full name, Esther Mae made her recording debut with Johnny Otis in August 1949 at a one off session for Modern Records. 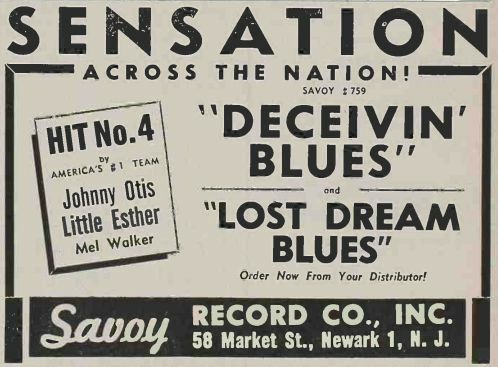 However it wasn't until the Otis group started recording for Savoy in November 1949 that Little Esther as she was now billed started making waves in the R&B world. With backing from the Otis band, Little Esther was paired with fellow Barrelhouse act The Robins (lead - Bobby Nunn) for "Double Crossing Blues." Issued in January 1950, the disc shot to the number one spot in the R&B charts. For her follow up Esther was paired with another Barrelhouse regular, Mel Walker. Their moody "Mistrustin' Blues" was another smash when it was released in March of 1950. It was paired with a Little Esther solo torch song "Misery" which garnered big sales on its own account. 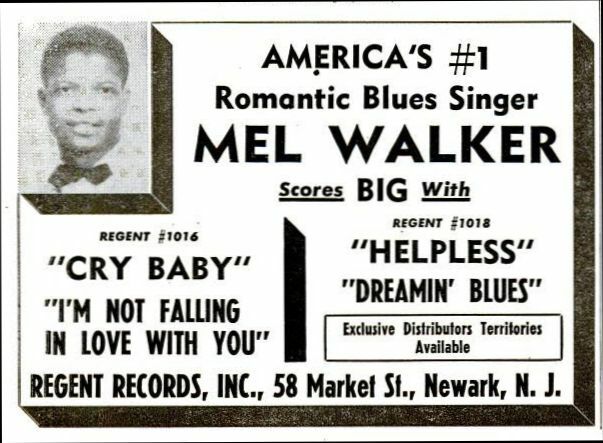 Another Little Esther / Mel Walker record, the more uptempo "Cupid's Boogie," was the third hit in a row when it was released in June 1950. In August a third Little Esther / Mel Walker performance, "Deceivin' Blues" kept the run of hits going. This was paired with an intense bluesy side from Little Esther singing solo, "Lost Dream Blues." Pete Lewis on guitar, Johnny Otis on vibes and Devonia Williams on piano turned in fine moody backing to make this an outstanding track. "Wedding Boogie," released in October, was based on a comedy skit performed in the Barrelhouse with Little Esther as the bride, Mel Walker as the groom and Lee Graves as the preacher. 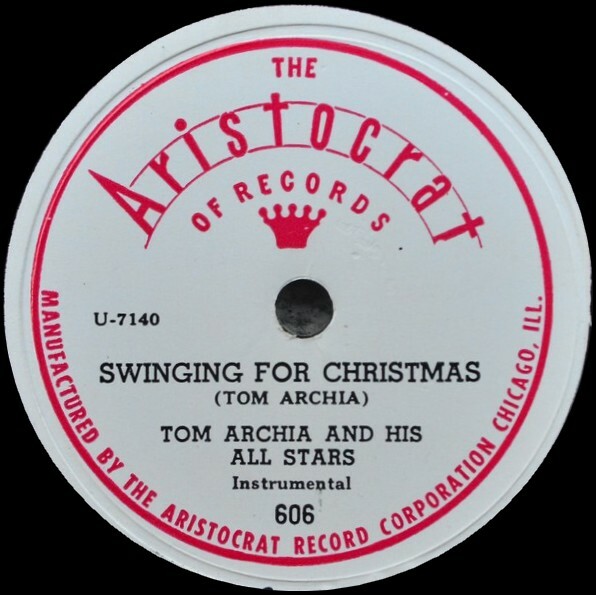 The B-Side was a Christmas weepie, "Far Away Blues (Xmas Blues)," and of course the release was another hit. A Little Esther / Mel Walker romantic duet, "Love Will Break Your Heart" came out in January 1951 but sales were comparatively poor, perhaps because it was too similar to Ivory Joe Hunter's hit "I Almost Lost My Mind." However by this time the spell was over, for Little Esther had already left Savoy when the disc was released. In December 1950 Savoy's man on the West Coast, Ralph Bass had quit the label following a dispute with owner Herman Lubinsky. Syd Nathan, honcho of rival label King, moved immediately to sign Bass and gave him a new West Coast based subsidiary label to run, Federal Records. "Double Crossing Blues" was issued on Savoy 731 in January 1950. Credited to the Johnny Otis Quintette with vocals by The Robins and Little Esther. The B-Side was "Ain't Nothin' Shakin'" by Leon Sims with the Johnny Otis Orchestra. 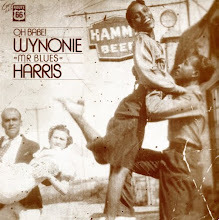 An April 1950 re-issue had a different B-Side - "Back Alley Blues" by The Beale St. Gang. "Lover's Lane Boogie" was not issued as a single. The Blue Notes were The Robins. "Mistrustin' Blues" / "Misery" issued as Savoy 735 in March 1950. A-Side credited to Little Esther with Mel Walker Accomp. by The Johnny Otis Orch. 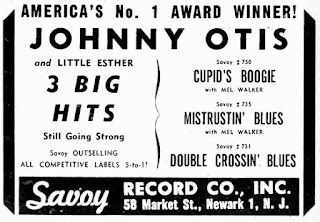 B-Side credit: Little Esther with the Johnny Otis Orch. "Cupid's Boogie" was issued on Savoy 750 in May or June 1950. Credit: Little Esther and Mel Walker with Johnny Otis Orchestra. This was the B-Side of the original release. 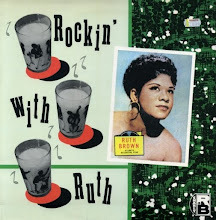 The A-Side was "Just Can't Get Free" - Little Esther with Johnny Otis Orchestra and The Beltones. 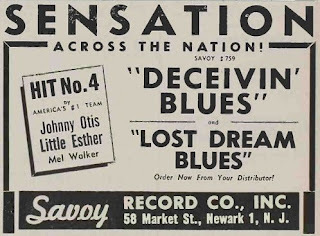 "Deceivin' Blues" / "Lost Dream Blues" issued as Savoy 759 in August 1950. A-Side credit: Little Esther and Mel Walker with Johnny Otis Orch. B-Side credit: Little Esther with Johnny Otis Orch. "Wedding Boogie" / "Far Away Blues (Xmas Blues)" issued as Savoy 764 in October 1950. A-Side credit: Johnny Otis' Congregation, Bride: Little Esther, Groom: Mel Walker, Preacher: Lee Graves. 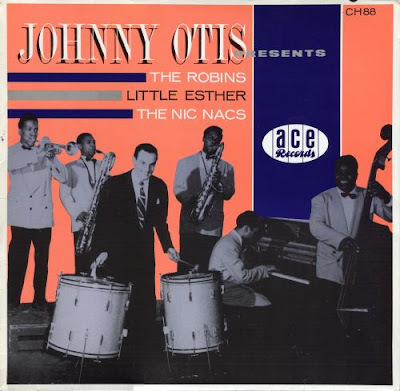 B-Side credit: Johnny Otis Orchestra with Little Esther and Mel Walker. "Love Will Break Your Heart" was issued on Savoy 775 in January 1951. Credited to Johnny Otis Orch. with Little Esther and Mel Walker. B-Side was "I Don't Care" - Johnny Otis Orch. with Little Esther. 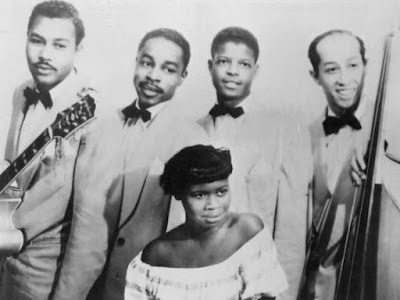 Above: Little Esther with (L to R): Pete "Guitar" Lewis, Lorenzo Holden, Mel Walker, and Mario Delagarde. "Lover's Lane Boogie" - recorded in Los Angeles, January 11th, 1950. Johnny Otis Septet: John Anderson (trumpet); Big Jay McNeely (tenor sax); Johnny Otis (vibes, drums); Devonia Williams (piano); Pete Lewis (guitar); Mario Delagarde (bass); Leard Bell (drums); Little Esther (vocals); Bobby Nunn (vocals); The Blue Notes (The Robins) (vocals). "Misery" recorded in Los Angeles, February 13th, 1950. 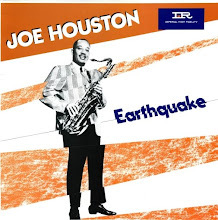 Possibly Lorenzo Holden or James Von Streeter (tenor sax); Johnny Otis (vibes); Devonia Williams (piano); Pete Lewis (guitar); Mario Delagarde (bass); Leard Bell (drums); Little Esther (vocals). "Mistrustin' Blues" and "Cupid's Boogie" recorded in Los Angeles, February 27th, 1950. 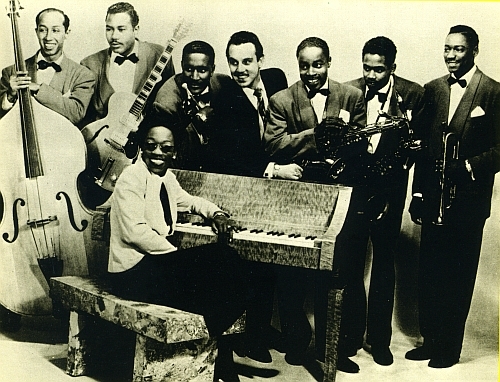 Johnny Otis Orchestra: Don Johnson, Lee Graves (trumpets); George Washington (trombone); Lorenzo Holden, James Von Streeter (tenor saxes); Walter Henry (alto,baritone sax); Johnny Otis (vibes); Devonia Williams (piano); Pete Lewis (guitar); Mario Delagarde (bass); Leard Bell (drums); Little Esther, Mel Walker (vocals). "Deceivin' Blues" and "Lost Dream Blues" recorded in Chicago on June 20th, 1950. Johnny Otis Orchestra: probable personnel: Don Johnson, Lee Graves, Hosea Sapp (trumpets;) George Washington (trombone); Lorenzo Holden, James Von Streeter (tenor saxes); Walter Henry (alto and baritone saxes); Johnny Otis (vibes); Devonia Williams (piano); Pete Lewis (guitar); Mario Delagarde (bass); Leard Bell (drums); Little Esther, Mel Walker (vocals). "Wedding Boogie," "Faraway Blues (Xmas Blues)" and "Love Will Break Your Heart" recorded in New York on August 12th 1950. 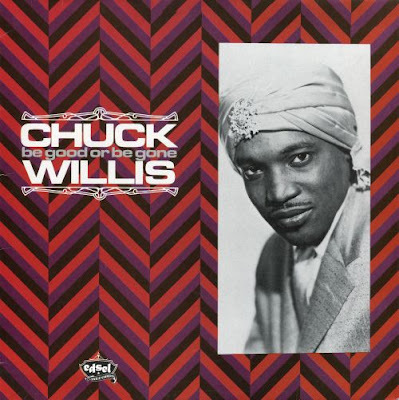 Personnel as for Chicago session above, with the addition of Lee Graves on vocals on "Wedding Boogie." 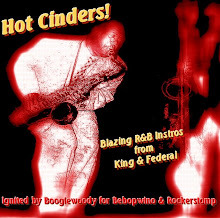 This LP was originally posted on Be Bop Wino back in 2007 and now makes a reappearance with new cover scans and a volume boost on the mp3s. The tracks credited to Johnny Otis and His Orchestra and to Little Esther are a "prequel" to the previous post "All Nite Long" which was a collection of mainly instrumental band tracks recorded by Johnny Otis for Savoy from November 1949 to March 1951. Before signing for Savoy, Johnny recorded a session for the Bihari brothers' Modern label in LA in August 1949. Only four tracks were recorded, two band instrumentals and two vocal tracks which marked the recording debut of Esther Mae Jones (still a few months shy of her 14th birthday), soon to become Little Esther, the R&B sensation of 1950. Johnny had spotted Little Esther at a talent show at a theatre in Watts and had recruited her to sing in his own club The Barrelhouse. 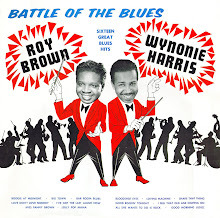 Two other acts featured on this collection, Pete "Guitar" Lewis and The Robins were also featured acts and talent show winners at the club, indeed it is Otis who is credited with being behind the formation of The Robins when he combined a vocal trio, the A-Sharp Trio (Ty Terrell, Billy Richard, Roy Richard) with bass singer Bobby Nunn. "Thursday Night Blues - Deep blues mood is achieved in this instrumental which spots a mess of guitar work and some orking which reminds of the Basie band." "I Gotta Gal - Thrush Esther Jones leaves hardly a note unbent as she weaves her way appealingly thru a bluesy ballad." In January 1950 "Double Crossing Blues" was released on Savoy 731, credited to "Johnny Otis Quintette, vocals by The Robins and Little Esther." 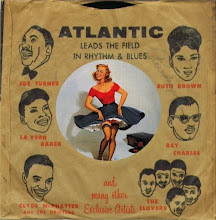 By February the disc was racing up the R&B charts and Little Esther was a big name in the music business. 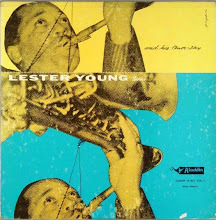 Modern reissued 20-715, still with "Thursday Night Blues" as the A-Side, but with the B-Side now given the correct title "I Gotta Guy" and credited to "Little" Esther with Johnny Otis and His Orchestra. In April 1950 Modern 20-748 was released with "Mean Ole Gal" on the A Side, credited to "Little" Esther with Johnny Otis and His Orchestra while the Otis instrumental "Good Old Blues" was on the B-Side. The A-Side was reviewed in the April 29th issue of Billboard as follows - "The talented young thrush registers with salty blues job that builds in mood all the way." The B-Side review was brief, to say the least - "Jump instrumental on a jazz kick." Above: Mel Walker, Johnny Otis and Little Esther. For two out of three it will end in tragedy. The four tracks credited to The Nic Nacs are in fact by The Robins. They were recorded for the Bihari's RPM label in November 1950. The reason for the subterfuge? The guys were actually under contract to John Dolphin's Recorded In Hollywood label at the time of recording. On "Found Me A Sugar Daddy," "Gonna Have A Merry Christmas" and "I'm Telling You Baby" the group were accompanied by Mickey Champion who sounded remarkably like Little Esther. 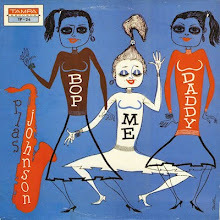 Indeed "Found Me a Sugar Daddy" was written as an answer record to "Double Crossing Blues." RPM 313 - "Gonna Have A Merry Xmas" / "Found Me A Sugar Daddy" was released in December 1950. A second RPM disc, RPM 316 - "You Didn't Want My Love" / "Found Me A Sugar Daddy" (again!) was issued in January 1951. The fourth RPM side, "I'm Telling You Baby," remained unissued. In March 1951 a disc was issued on RPM's parent label, Modern, credited to Bobby Nunn (with the "Robbins") in what appears to have been an attempt to forestall legal action by Recorded In Hollywood while at the same time signalling to fans that here indeed was a big time act! The A-Side of Modern 807 was "Rockin'" while the B-Side, "That's What The Good Book Says," was the first commercial composition by songwriting team Leiber and Stoller. The backing band sounds suspiciously like the Johnny Otis band. During a large part of 1951/52 The Robins were inactive, although Bobby Nunn had releases on Dootone and Recorded In Hollywood and also recorded several duets with Little Esther for Federal. In late 1952 the group reformed with the addition of new member Grady Chapman. The quintet started recording for RCA in January 1953. Their last RCA session was in September 1953, with their next session being another for the Biharis in December 1953. Four of the six tracks recorded are featured on this LP. 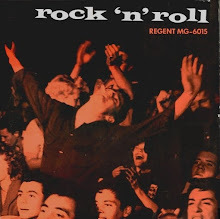 They were originally issued as singles on the Crown subsidiary of Modern - "I Made A Vow" / "Double Crossin Baby (Crown 106) came out in February 1954, while "Key To My Heart" / "All I Do Is Rock" (Crown 120) appeared in August 1954. 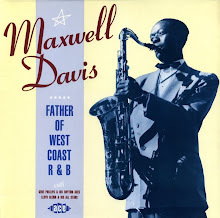 The session was produced and arranged by Maxwell Davis. By the time "Key To My Heart" appeared the group, which now had Carl Gardner as a replacement for the temporarily indisposed Grady Chapman, had signed up to Leiber & Stoller's new Spark label and had recorded and released "Riot In Cell Block #9." 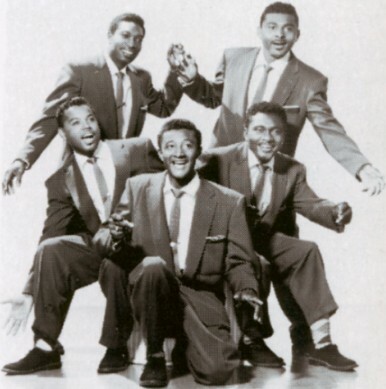 This was the beginning of the process which would see the group split in September 1955 when Leiber & Stoller joined Atlantic taking their Spark masters with them, along with Bobby Nunn and Carl Gardner who became one half of a new group, The Coasters, while Ty Terrell, Grady Chapman and the Richard brothers continued as The Robins. But that may well be the subject of a future post! Above: The Robins in 1953. Back row (L to R): Bobby Nunn and Billy Richard; Middle Row (L to R): Grady Chapman and Roy Richard; Front: Ty Terrell. Plenty of pics! Who sued who! How many labels can you record for at the same time! The danger of signing any contract! The draft or prison - you decide! Another in the Savoy series of home made "LPs" and this time the quintessential New York indie record company goes way out west to the Land Where Dreams Come True as label prexy Herman Lubinsky recruits producer Ralph Bass (who had previously been with Black & White Records) to be Savoy's man on the Coast. And then Bass recruits Johnny Otis, his dynamite band (as you can hear on this collection) and his star vocal acts Little Esther, Mel Walker and The Robins. 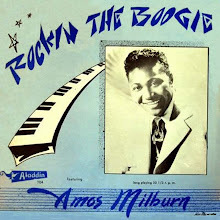 The result was a staggering series of R&B hits by the Otis organisation in 1950, including "Double Crossing Blues," "Mistrustin' Blues," "Cupid's Boogie" "Deceivin' Blues," "Wedding Boogie" and "Cry Baby." These vocal hits will feature in future compilations but in this post I've concentrated on the mainly instrumental sides recorded by the band itself. 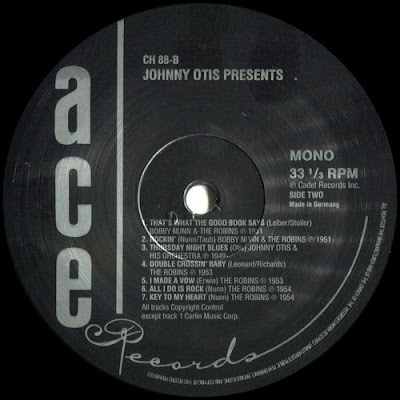 Johnny Otis, drummer, vibes player, pianist, occasional vocalist, bandleader, impresario, nightclub owner, producer and arranger, talent spotter, song writer, disc jockey, label owner, political activist, minister of religion, artist, writer and chicken farmer was what you might call a Renaissance man. He simply did it all. He was born John Veliotes in 1921 in Vallejo, California into a Greek immigrant family. He was raised in Berkeley where his parents owned a grocery store which served the local Black community, a community with which Johnny would identify for the rest of his life. 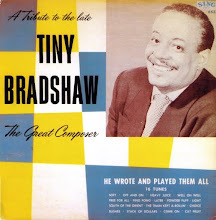 He was a fan of big band swing, especially of the band of Count Basie. As the 1930's turned to the '40's, Johnny took up playing the drums and gained his first band experience with a local small group, Count Otis Matthews & His West Oakland House Rockers. 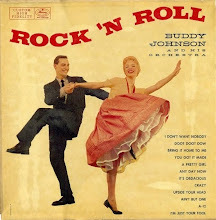 The basic blues 'n' boogie of the group would stand Johnny in good stead in the future when the big band era came to end and rhythm 'n' blues took its place. 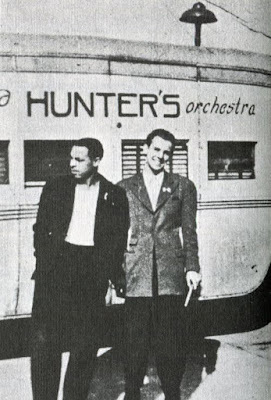 But before that, back in 1941, Johnny got his chance to play in a big swing band when he joined the long established Omaha based outfit of Lloyd Hunter. Also in the band were alto sax man Preston Love, tenor sax players Paul Quinichette and James Von Streeter and bass player Curtis Counce, all of whom would spend spells in Johnny Otis led bands in the future. 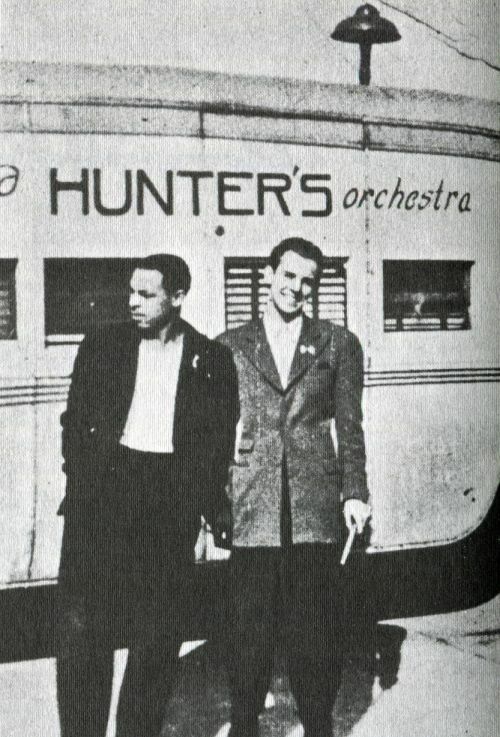 After two years with Lloyd Hunter, Johnny Otis and Preston Love quit to form their own band, but it was short lived as Count Basie came in for Love. Hearing that former Kansas City bandleader Harlan Leonard (now established at the Club Alabam in Los Angeles) was looking for a drummer, Johnny headed to LA where he got the spot, staying with Leonard until 1944 when he transferred to a band led by former Chick Webb front man Bardu Ali. Johnny and Bardu would later become business partners when they opened The Barrel House Club in Watts in late 1947. In 1945 Johnny formed his own big band as the new house band at the Club Alabam and signed with Excelsior Records in the autumn of that year. 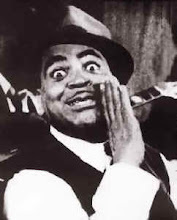 His second disc for the label, "Jimmy's Round The Clock Blues," featuring Basie blues shouter Jimmy Rushing on vocals, backed with the classic bump 'n' grind instrumental "Harlem Nocturne" was a big seller and the band embarked on a national tour on the back of it. The Johnny Otis Orchestra recorded for Excelsior as a big band until December 1946 but by the next and final Excelsior session in December 1947 the band had slimmed down to an eight piece. 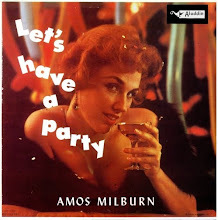 The first track on this compilation "Midnight In The Barrelhouse" dates from that session although it was re-released on Savoy in 1951, thus justifying its inclusion here. The final Excelsior line up included several musicians who would be mainstays of the Johnny Otis band during its most successful years - George Washington on trombone, Pete "Guitar" Lewis, and Mario Delagarde on bass. The band's next recording session was for Modern in August 1949 which was the first session to feature Little Esther on vocals. 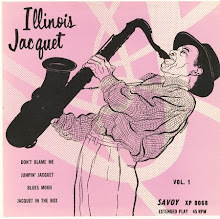 In November 1949 the band started recording for Savoy with Don Johnson on trumpet, Lorenzo Holden and James Von Streeter on tenor saxes, Walter Henry on baritone sax, Devonia Williams on piano and Leard Bell on drums. 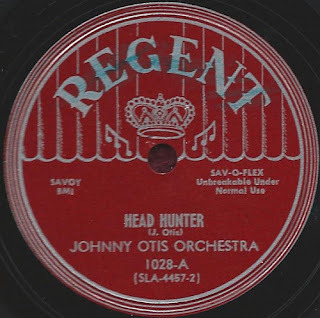 Along with Lewis, Washington and Delagarde this would be the core of the Johnny Otis band on Savoy and subsequently on Federal (unofficially) and Mercury. 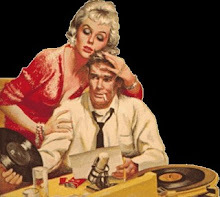 "Midnight In The Barrelhouse" recorded in Los Angeles, December 1947. 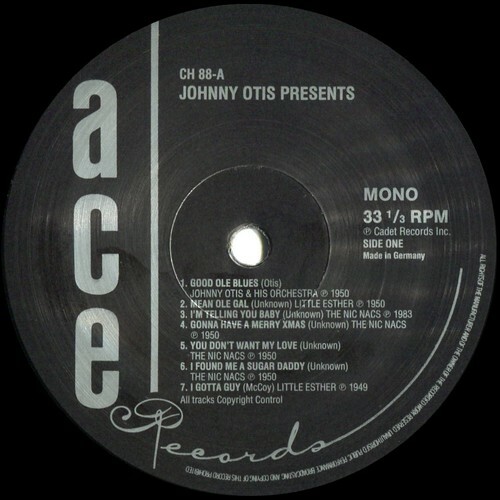 Johnny Otis Orchestra : John Anderson (trumpet); George Washington (trombone); Cecil "Big Jay" McNeely (tenor sax); Lem Tally (baritone sax); "Darby Hicks" (piano); Pete "Guitar" Lewis (guitar); Mario Delagarde (bass); Johnny Otis (drums). Released on Excelsior JR 536 in February 1949. There were two virtually simultaneous Johnny Otis releases numbered Excelsior JR 536. "Happy New Year Baby" / "Barrel House Stomp" was listed in advance release notices in Billboard, 29th January 1949. This record was reviewed in Billboard on 12th February 1949. 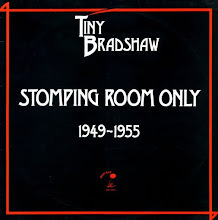 A second disc with the number 536, "Midnight In The Barrel House" / "Barrel House Stomp" was probably released shortly afterwards as it was rather late for a "New Year" release. "Midnight In The Barrelhouse" (note change in spelling) was re-released on Savoy 815 in September 1951 as the B-Side of an alternate take of "Harlem Nocturne" which was originally released on Excelsior JR 142. "Boogie Guitar" and "Hangover Blues" recorded in Los Angeles on November 10th, 1949. Johnny Otis and his Orchestra : Don Johnson and Lee Graves (trumpets); George Washington (trombone); Lorenzo Holden, James Von Streeter (tenor saxes); Walter Henry (baritone sax); Johnny Otis (vibraphone, drums); Devonia Williams (piano); Pete Lewis (guitar); Gene Phillips ( Hawaiian guitar on "Hangover Blues"); unknown 2nd guitar on "Boogie Guitar"; Mario Delagarde (bass); Leard Bell (drums). This was the first Johnny Otis Orchestra session for Savoy. "Boogie Guitar" first released on Savoy LP SJL 2230 "The Original Johnny Otis Show" in 1978. "Head Hunter" and "New Orleans Shuffle" recorded in Los Angeles on December 23rd 1949. Probable personnel - Johnny Otis Orchestra: Lee Graves, Don Johnson (trumpets); George Washington (trombone); Big Jay McNeely, Lorenzo Holden (tenor saxes); Walter Henry (baritone sax); Johnny Otis (vibes); Devonia Williams (piano); Pete Lewis (guitar); Mario Delagarde (bass); Leard Bell (drums). It's possible that James Von Streeter is present in place of Big Jay McNeely. "New Orleans Shuffle" / "Blues Nocturne" released on Savoy 743 in May 1950. "Head Hunter" / "Cool And Easy" (vocal by Redd Lyte) released on Regent 1028 in January 1951. Also listed under Savoy 774. 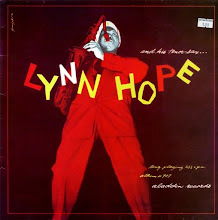 "The Turkey Hop Parts 1 & 2" and "Blues Nocturne" recorded in Los Angeles on January 11th 1950. 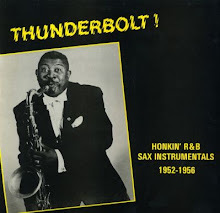 Personnel: John Anderson (trumpet); Floyd Turnham (alto sax); Big Jay McNeely (tenor sax); Bob McNeely (baritone sax); Devonia Williams (piano); Pete Lewis (guitar); Mario Delagarde (bass); Johnny Otis (drums); The Robins - vocals on "The Turkey Hop Part 2." "The Turkey Hop Part 1" / "The Turkey Hop Part 2" released on Savoy 732 in February 1950. "Blues Nocturne" released on Savoy 743 in May 1950, B-Side of "New Orleans Shuffle." 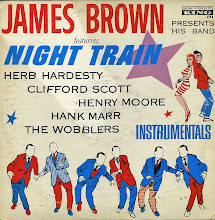 "Freight Train Boogie" was recorded in Chicago on June 20th 1950. Personnel: Johnny Otis Orchestra: probably - Don Johnson, Lee Graves, Hosea Sapp (trumpets); George Washington (trombone); Lorenzo Holden, James Von Streeter (tenor saxes) Walter Henry (alto, baritone saxes); Johnny Otis (vibraphone); Devonia Williams (piano); Pete Lewis (guitar); Mario Delagarde (bass); Leard Bell (drums). "Freight Train Boogie" released on Regent 1021 (b/w "Good Time Blues" vocal Redd Lyte) in August 1950. "Mambo Boogie" was recorded in Los Angeles on January 10th 1951. Personnel - Johnny Otis Orchestra: Don Johnson (trumpet); George Washington (trombone); Walter Henry (alto sax); Lorenzo Holden, James Von Streeter (tenor saxes); Johnny Otis (vibes); Devonia Williams (piano); Pete Lewis (guitar); Mario Delagarde (bass); Leard Bell (drums). "Mambo Boogie" was released on Savoy 777 as the B-Side of "Gee Baby" (vocal - Mel Walker) in February 1951. 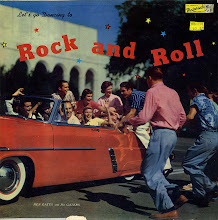 "All Nite Long" and "Honky Tonk Boogie" were recorded in New York City on March 19th and March 21st respectively, 1951. Personnel - Johnny Otis Orchestra: probably - Don Johnson (trumpet); George Washington (trombone); Earl Warren (alto sax); Lorenzo Holden (tenor sax); Walter Henry (alto and baritone sax); Devonia Williams (piano); Johnny Otis (vibes, percussion); Pete Lewis (guitar); Mario Delagarde (bass); Leard Bell (drums); vocal: Johnny Otis, George Washington and the band. The March 21st session was the last Johnny Otis Orchestra session for Savoy. "All Nite Long" was released on Savoy 788 b/w "New Love" (vocal - Mel Walker) in July 1951. "Honky Tonk Boogie" was first released on Savoy LP SJL 2230 "The Original Johnny Otis Show" in 1978. El Enmascarado's rips from a 78 rpm Johnny Otis disc. Includes added James Von Streeter and Big Jay McNeely tracks plus plenty of background info / speculation. Check it out. More Johnny Otis coming soon!